Fairy tales, witches, and once upon a time stories have been replaced nowadays by monsters and a new world of superheroes which keep kids riveted to their devices. Many parents give in to this easy solution. It keeps their kids off their hair for long periods of time. A small number of them restrict watching time to a maximum of 2 hours per day exhorting their kids to play outdoors or to exercise their brains with educational games. Not an easy task when the majority of kids and adults can’t keep their eyes off their devices. The “it’s not fair…why my friends can watch for hours…” makes the parents’ job very hard. 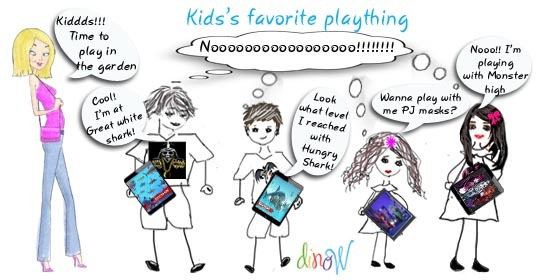 Even when kids have play dates, their preference goes to watching or playing on their devices. Every child is in a world of its own opening the path to a future of loneliness and social awkwardness.